'Let’s get it straight from the outset – this is noisy and it won’t get much radio play. Most listeners will not make it through the first track and I’ve seen this kind of stuff empty a bandroom when played loud enough. For those of you who do like it noisy and who like improv that flows between freefall and structure, then this should be for you. Although tagged on Bandcamp as doom, I found the record to be lots of fun. Not surprising if you follow Kellar‘s conversations on Twitter. Largely up-beat with plenty of variation within and between each track. “Noise”can often be code for “all sounds the same” but that’s certainly not the case here. Opening with ‘The Royal Illusionists’, Kellar throw almost everything at the listener. It’s as though they are throwing down the challenge to see who wants to stick it out. Flourishing guitar improvises over a loud industrial drone and spasmodic drum beats. If you’re still there, Kellar rewards you with a change of sound. ‘The Vanishing Lamp’ with its fuzzy bass, pulsating drone and strong nod to metal is a great second track. There’s even a hint of melody for a brief moment, not that melody is what you will be after. ‘Self Decapitation’ is held together with the drums that are the closest you will get to straight up rock on this record. Even the bass lumbers from one giant foot to the other, but this is not rock as you know it. ’The Nested Boxes’ takes me back a long time to sitting in my bedroom with a morse code oscillator recording all the sounds I could make onto cassette. This track is a hoot and best illustrates the fun Dave, Dan and Andy are having. The final, title track (allegedly recorded in a public toilet) rambles along as you might expect an 18-minute final track to do. Probably the most accessible in sound I’m convinced the length is deliberately ironic. 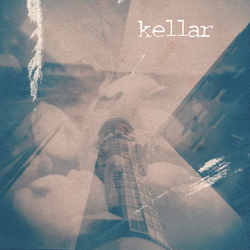 Kellar has released this one-hour record through Bandcamp as a download or as a CDR. Interestingly they have gone down the path of charging a set price rather than name-your-price. Again, this is not surprising given the confidence they radiate. You need to be in the mood for this record. It’s one I don’t ever foresee putting on as background music, to get the party started or as drive music. I think I will only ever listen on my own when I am relaxed and comfortable. I do know that when I do listen to it I will be smiling.